Yesterday, we got our album mastered. So what does mastering involve and what does it mean? It’s a hugely significant step. It has taken two years of writing, performing, experimenting and brain storming, followed one year of recording to get to this point. Once the music is mastered, it can no longer be touched or tweaked. It is finished and sealed for eternity. It is a bit like a painter finishing his painting, spraying a lacquer over everything, framing the picture and polishing the glass. The slightly bizarre thing is that I am not sure what actually happens during this process. It is a dark art to me. The mastering technician spent the day listening intensely to the music and then making slight adjustments to dials and pressing buttons. I know that the aim is to make the music sound as good as it possibly can, no matter what device is being used to play back the music. Tiny adjustments are made to EQ levels and the overall volume of songs is boosted to the point where the music is loud, but doesn’t distort. 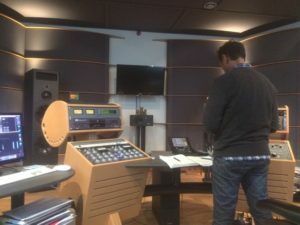 The inside of a mastering suite is very different to that of a recording studio. There are no musical instruments lying around. Just the most amazing sound system you will ever hear. The music enters the mastering suite sounding pretty good and leaves sounding amazing. Our aim is get our album pressed onto vinyl. To do this we have had to get two versions of our album mastered. One for digital and CD release and one for vinyl. Each version requires slightly different treatments. In the room adjacent to the main mastering suite was housed a Georg Neumann VMS70 Cutting Lathe. This particular machine was manufactured in the early 1970s and spent the majority of its life in Nashville, USA before coming back to Europe a few years ago. There is only one service engineer in the UK. 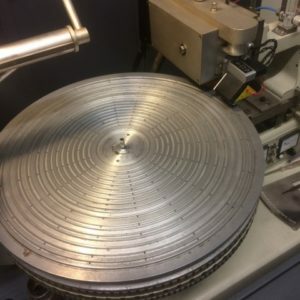 Whilst the demand for vinyl is growing, the capability of producing vinyl is still pretty small. Apparently new machines are now being built. 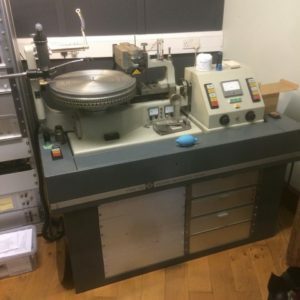 If (and hopefully when) we reach our crowdfunding target to cover the vinyl manufacture costs then our master 14″ plastic discs will be cut on this machine. The vinyl duplication is then most likely to be outsourced to France, Germany or the Czech Republic. We have been advised that the turnaround time from pressing go on the order to receiving the actual finished vinyl is approximately 12 weeks.